Last week we ate at The White Horse and had the most delicious samosas. They were served with a mango chutney on the side which was so good that I couldn’t stop thinking about it. Knowing I had a big bag of apples sitting at home, I decided to try to make a chutney that had some similar flavors to the one I loved so much from The White Horse. The main problem – I hadn’t paid very close attention to all of the flavors in the mango chutney. Also, I didn’t have any mangoes. So, like many of my recipe ideas, I pretty much substituted out so many of the ingredients and flavors in the original that the one I ended up with was nothing at all like the one that inspired the idea in the first place. The only resemblance is that it is still a chutney. I love the way this one turned out, but I’m definitely going to have to go back to The White Horse for another round of samosas. 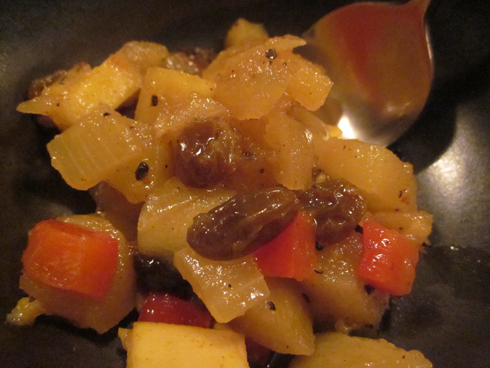 This chutney has a nice blend of sweet, sour, spice, and variety of textures. It would be excellent served with pork, as a topping for roasted vegetables, or with some bread and cheese. It can be served at any temperature, but I prefer to bring it to room temperature before serving. It was very easy to make, and has a nice mild flavor. Since I was making this for some people who prefer foods on the mild side, I cooked a hot chile in oil to give it a touch of heat then discarded the pepper. I also used a pretty mild curry which gave it good flavor with only a little bit of heat. I’ll definitely make it again, and it might be soon because I have a feeling the jars I made will go pretty quickly. In a large pot over medium high heat, add oil. When oil is hot, add hot chile and cook for 2-3 minutes. Remove the chile and discard. Add onion and cook until softened. Add garlic, bell pepper, and ginger and cook for 2-3 minutes. Add apples, and cook for one minute. In a small bowl, combine water, vinegar, brown sugar, curry powder, and cardamom. Add to pot and bring to a boil. Reduce heat to simmer, and add raisins. Cook for 30 minutes, stirring occasionally. Remove from heat and fill four pint jars. Place caps on tightly, and process in canner for 20 minutes. Remove from canner and set aside to cool. – If you like things on the spicy side, skip the chile step and just add some crushed red pepper. You could also increase the amount or the heat of the curry you use. – It is super important to crush the cardamom so you don’t end up with any whole bits, don’t skip this step. – If you don’t want to can these, you could just add them to jars and refrigerate. I don’t know how long they will last though, so you might want to use them up fairly quickly.